"Hongbin Zhao's art is my favorite in the Art Fair"
Guangzhou International Art Fair is one of the three leading art expositions in mainland China. 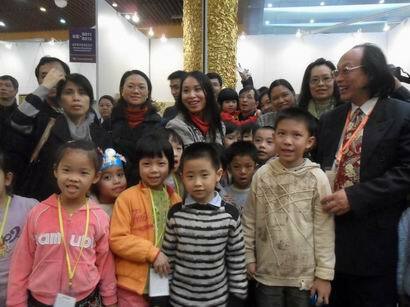 The 15th Guangzhou International Art Fair (GIAF2010) was held in Guangzhou Baiyun International Convention Center on 9th – 13th December 2010. 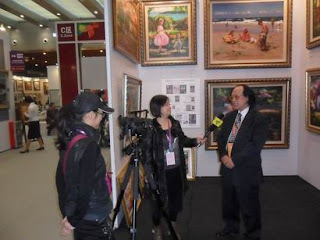 Contemporary master painter Hongbin Zhao was highlighted in the show and interviewed by two major TV networks. A mother with a lovely daughter was very excited about the show. 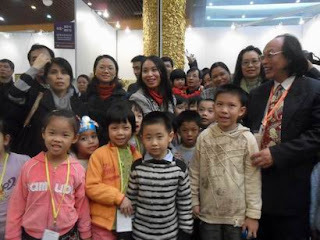 “I visit Guang Zhou Internation Art Fair a few years ago. The scale of this year’s show is much bigger. Hongbin Zhao's art is my favorite in the Art Fair.” The mother told the media during an interview. “I like the artist who paint Children” The little Daughter said to the reporter when she was being asked which artist does she like most. Actually the artist who paints Children Series - Talk with the Angels Series is Hongbin Zhao.